The International Committee of the Red Cross (ICRC) has called for the others to be freed, saying the Red Crescent provided vital help for those in need. "We gave orders to our Baghdad staff to stop working till further notice," said Mazen Abdallah, the Iraqi Red Crescent's secretary general. "We renew our calls for the release of the kidnapped persons." The 13 freed people were mostly guards and drivers, Mr Abdallah said. 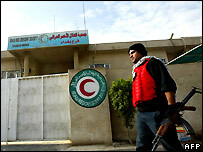 He said the Red Crescent's other offices outside Baghdad were open as usual. Officials described how a large convoy of new vehicles similar to those used by the Iraqi police drew up at the Red Crescent office in Baghdad on Sunday. Men in uniforms similar to those of the Interior Ministry's special commando forces got out and entered the building, saying they had been sent to check the premises. Once inside, they rounded up all the men at gunpoint, including employees and visitors. 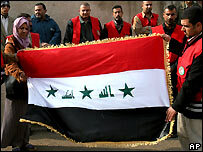 Three Iraqi guards from the nearby Netherlands embassy were also seized. The interior ministry has said that none of its units had been on duty in the area at the time. The kidnappings are the latest in a long series of similar operations and the second in less than a week. On Thursday, gunmen in military uniforms kidnapped up to 70 people from a commercial area in the Sanak area of the capital. At least two dozen people were subsequently freed. Many of the kidnappings have been blamed on Shia militias masquerading as police commando units. But there is also a suspicion that the police are so infiltrated by the militias that they are indistinguishable from each other, says the BBC's Jim Muir in Baghdad. Criminal gangs seeking ransoms are also involved in kidnapping. The Iraqi Red Crescent, the country's biggest humanitarian organisation, has previously been the target of the insurgency and random attacks. On Friday, the organisation accused US troops of attacking its office and vehicles. The Red Crescent, which has a staff of 1,000 and 200,000 volunteers, is the only Iraqi aid group working across the country's 18 provinces.